More than 688 institutions and nearly 60,000 individual investors worth $5.2 trillion have pulled their investments from fossil fuel companies. 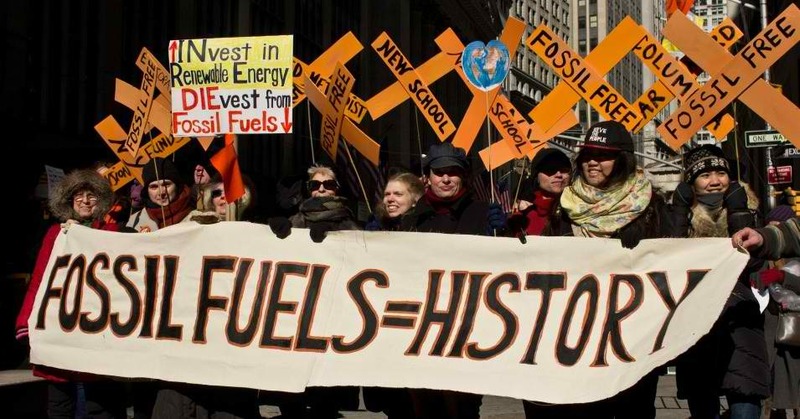 In 2011, students across the United States launched a movement urging companies and individuals to pull their investments in the fossil fuel industry. While that was then seen as little more than an insignificant and harmless way to stand up for the environment, the succeeding years are beginning to prove this assumption wrong as the fossil fuel industry’s bottom line faces its biggest threat ever. By this time last year, investors holding more than $2.6 trillion worth of assets pledge to pull them from the fossil fuel industry. Over the last 15 months, investors holding double that amount have joined them in pledging to pull their money from the industry. The Divest Invest Initiative, a campaign propelling a movement for individuals to withdraw investments from the fossil fuel industry in favor of clean energy, has gathered almost $5.2 trillion in divestment pledges from 688 institutions and 58,399 individuals from 76 countries as of December 12. This is a giant leap up from the $52 billion that had been removed by investors as of September 2014. In 2013, the fossil fuel industry made $331 billion in profits in the US and Canada alone — if it were a country, it would rank 36th in global GDP. A white paper from Bloomberg pegs stock market values at nearly $5 trillion, making fossil fuel one of the world’s largest asset classes. Investors “voting” in the language of money can have a big impact on how quickly the world turns away from fossil fuels in favor of renewable alternatives. However, simply using renewables isn’t enough. Carbon emissions as by-products of the processes involved in generating these supposedly clean renewables still contribute to our greenhouse gases. As the world moves toward more responsible energy generation options, new technologies are emerging that will make renewable energy cheaper and more efficient. Perhaps the next step is doing the research necessary to perfect the processes and make “clean energy” truly as clean as possible.